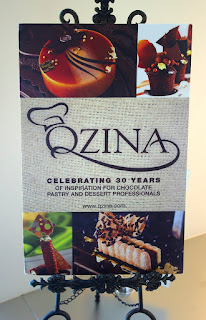 My last post, I talked a little about artisan chocolates. People making chocolate directly from the bean, and how different they can taste. A bunch of these chocolate makers also make chocolate for drinking. So of course, I've ordered tons of them! If you saw my pantry shelves and how many hot chocolates I have... well, let's not even go there. One at a time. And today it's Askinosie. I first learned about Askinosie when learning about artisan chocolates. I ordered a few bars from various makers from a website, and Askinosie's packaging was really cool. On the front of a lot of their bars, they put a picture of the farmer whose farm the beans came from. You're actually seeing the guy responsible for growing the beans that made the bar you're about to eat! And they write a little about him on the back. Really amazing! 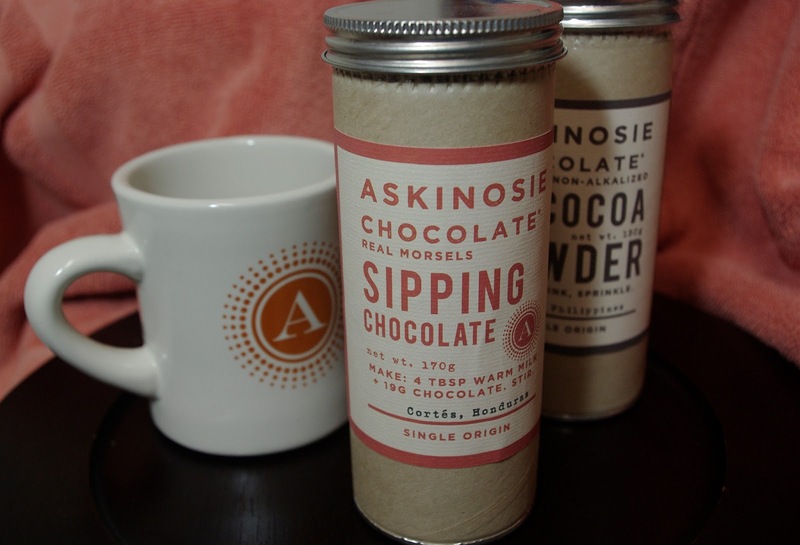 Over at the Askinosie web store, I found a great drinking chocolate package. Yep, I got it all. 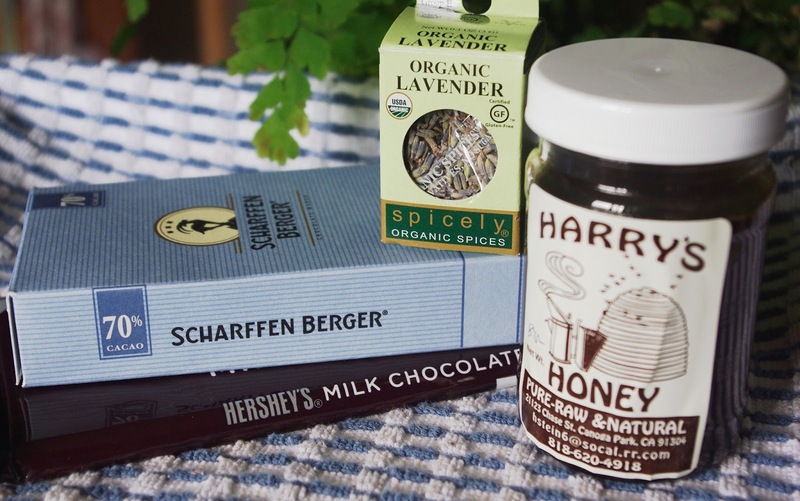 The sipping chocolate, their amazing cocoa powder, a mug, and even a t-shirt. Their sipping chocolate (a term that just means thick, strong hot chocolate) comes in these neat cardboard canisters and has the instructions right on the front. It also tells you where the batch of beans that made this sipping chocolate originated from. Mine is from Cortes, a state in Honduras. You can see it's just chopped chocolate. That's always ideal! The instructions on the package calls for 4 tbsp of milk with 19 grams of chocolate. I don't have a scale in my kitchen yet, so I looked up a conversion. 19 grams is roughly 4 teaspoons. And look at this little pot! Here in Los Angeles, there are a lot of international markets, and browsing some of them, I kept seeing these little pots in the kitchenware sections. It's only a few cups, it has a handle for pouring, and a little pour spout. I learned it's a Turkish coffee pot, but mine is strictly for hot chocolate! 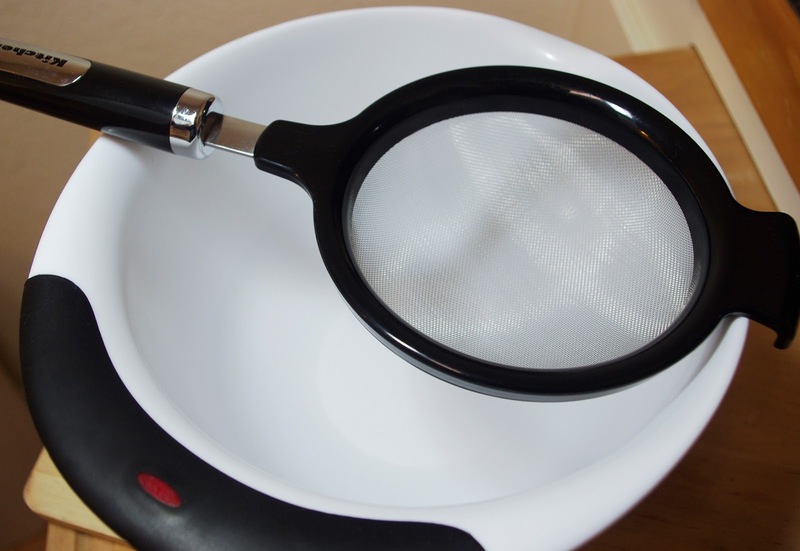 It's perfect for small servings, easy to clean, and still just big enough to be able to whisk inside of it. 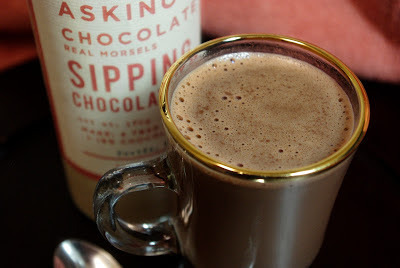 Askinosie's sipping chocolate isn't as thick as some others I've made, but it is nice and strong. It's a very dark chocolate flavor, pretty bitter, so if you're not used to dark chocolates yet, you may want to add a little sugar to taste. If you drop a marshmallow or some whipped cream on top, that would balance it out nicely. I'm having mine straight, though. I love the strong dark flavor. It's that very flavor that taught me not all hot chocolate comes from a packet. You can also taste some fruity undertones in the chocolate. If you don't at first, sip it slower and really try to taste the complexities of it. It's even a little tangy once you notice it. So what are you waiting for, go order some of this already! While you're at their site, grab a chocolate bar or two. You'll be blown away by the flavors! Even if you think you're just getting a regular dark chocolate bar, it's going to surprise you. I'm going to be reviewing another Askinosie drinking chocolate very soon, their Tableya. It may be the most socially responsible hot chocolate on the planet, and the story behind it is amazing. Obviously, I love chocolate. It's amazing stuff. Although I blog about real hot chocolate drinks, I do of course have tremendous love for chocolate in general. In the past year or so, I've also come to understand that chocolate doesn't only mean Hershey's, Nestle, and Cadbury's. We all know these names because these are the companies that are big enough to have their products in every gas station and market in the world. 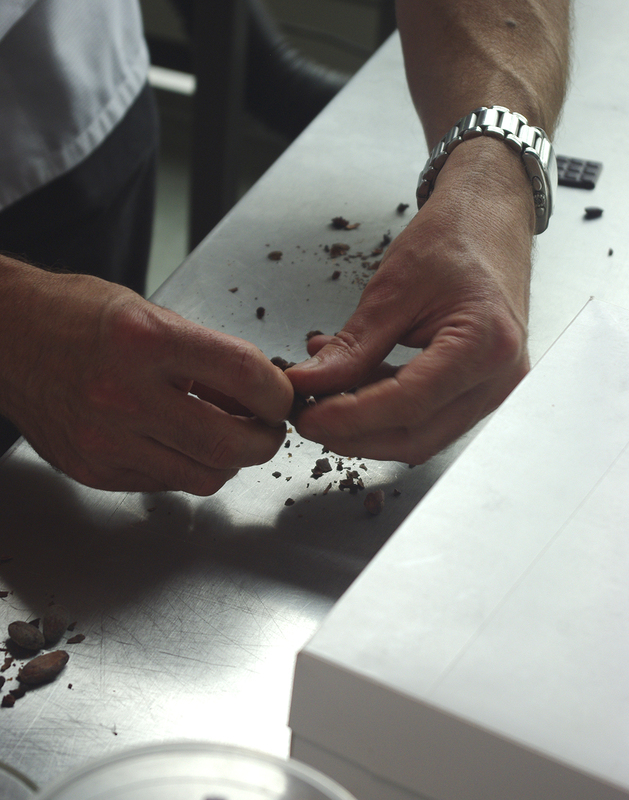 Unknown to most, there is a world of artisan chocolates. People who make chocolate by themselves, in a regular kitchen, with utensils everyone can buy. I don't mean making chocolate as in melting down some baking chocolate and pouring it into molds. I mean taking a cacao plant and turning it into a chocolate bar. "Artisan" means they're doing it for the art of the process, not with the goal of making the most money, but with the goal off seeing what kinds of flavors develop from certain types of bean, and really letting that singular flavor come through. This sounds odd until you try your first artisan bar. More often than not, they're fruity and tangy, sometimes they're earthy and nutty. When you look at the ingredients list and all it says is "cacao beans, sugar", that's when the surprise hits. Where did all that fruitiness come from? Why was one bar sour and citrus flavored, when another was smokey and bitter? That's what artisan chocolate makers are exploring, that range of flavors in different types of beans. It's astounding! It's really hard to fathom the variety until you try a few. Some of these makers, like Mast Brothers, Patric, and Madre, have small factories or shops, usually just one building in one location. Some, like Potomac, are so small, the chocolate maker is literally working in his basement on machines he built himself. Others, like Taza and Chocovivo, stone grind their chocolates, or only grind them once, leaving them with a texture unlike any others. Chocovivo doesn't even temper theirs! 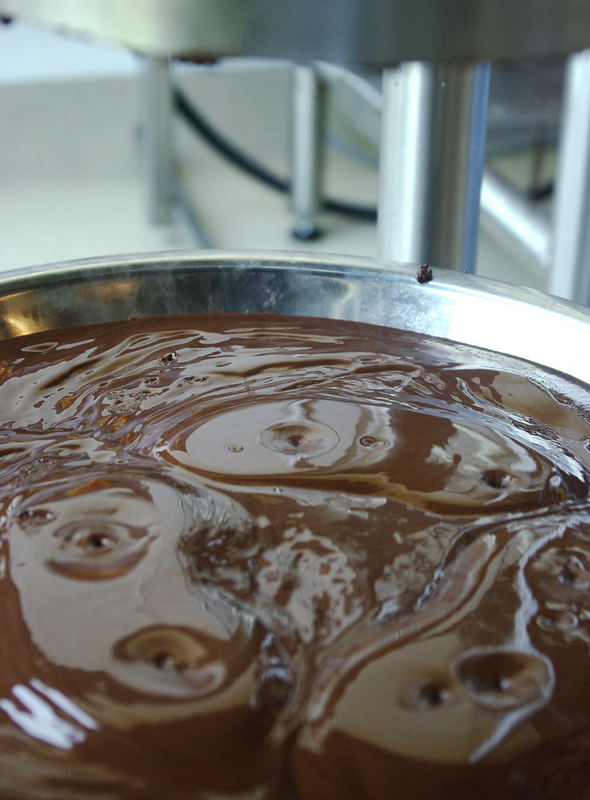 What is tempering? 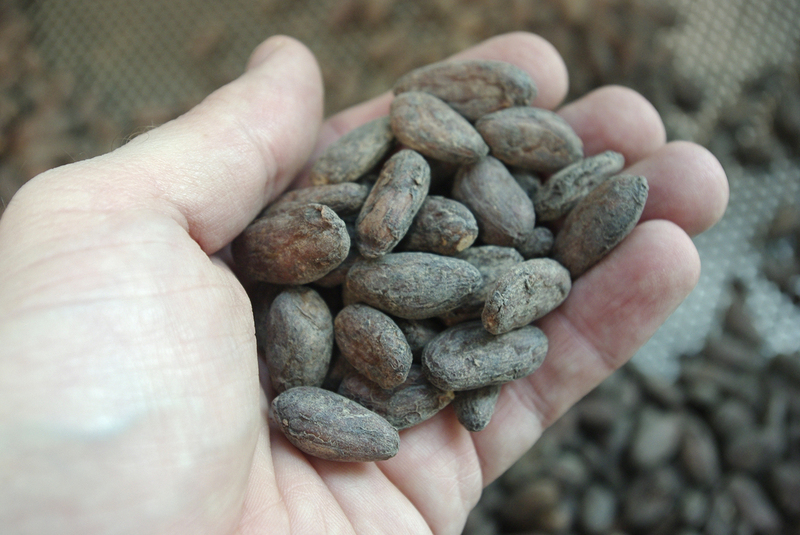 What does a cacao bean look like? How does it become a chocolate bar if all you have to add is sugar to make it? The more I tasted these amazing chocolates, the more questions I had. I searched online, read wikipedia entries, watched youtube videos, but it's not the same as seeing it done in a kitchen, being a part of that process from beginning to end. So when I found this two day class, I signed up! It's held at a place in Orange County, CA, called Qzina. 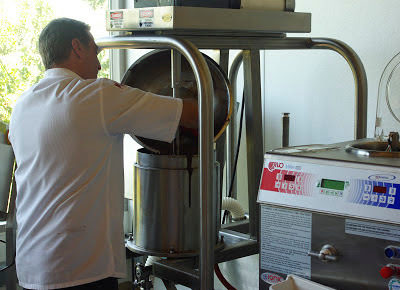 They supply restaurants, bakeries, and caterers all over southern CA. 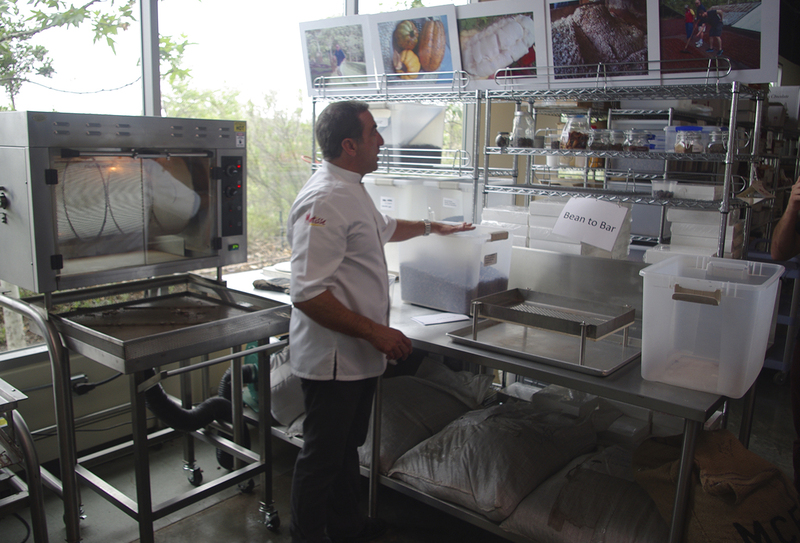 They also have a bunch of classes in pastry and confection making. 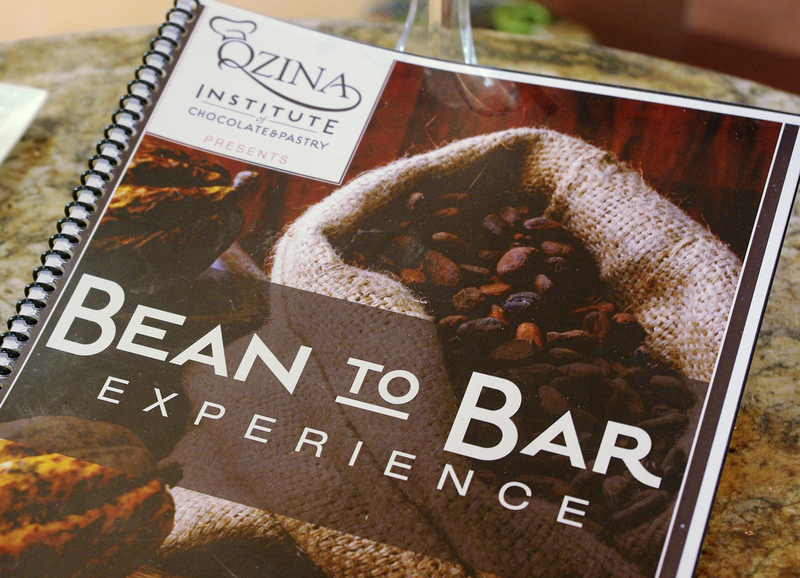 As much as I was interested in learning how chocolate is made, I also was really hoping to come away with enough knowledge to perhaps make a hot chocolate directly from the cacao bean! How awesome would that be?! 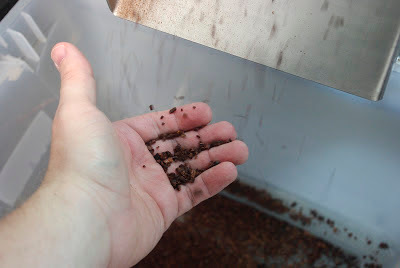 So, in that spirit, let me show you what it was like to make chocolate from a bin of cacao beans! This is the inside of the Qzina showroom and demonstration lobby. 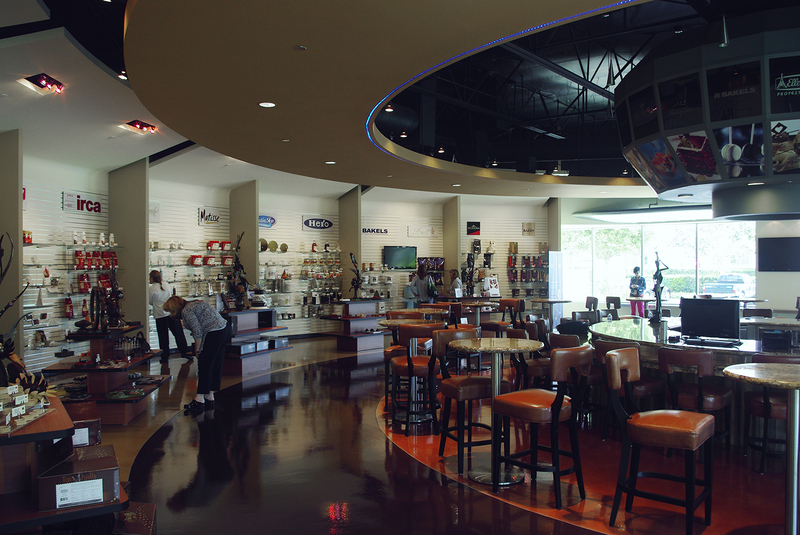 We browsed the products they sell, admired the amazing chocolate sculptures created by the chefs, and ate lunch here. Chef Francois Mellet was our instructor. He is very French, and absolutely amazing at what he does. Which is work with chocolate. In Qzina's huge storeroom, he explained to us the entire process. See the plastic bin his hand is resting on? That's 30 pounds of cacao beans. This room was amazing. 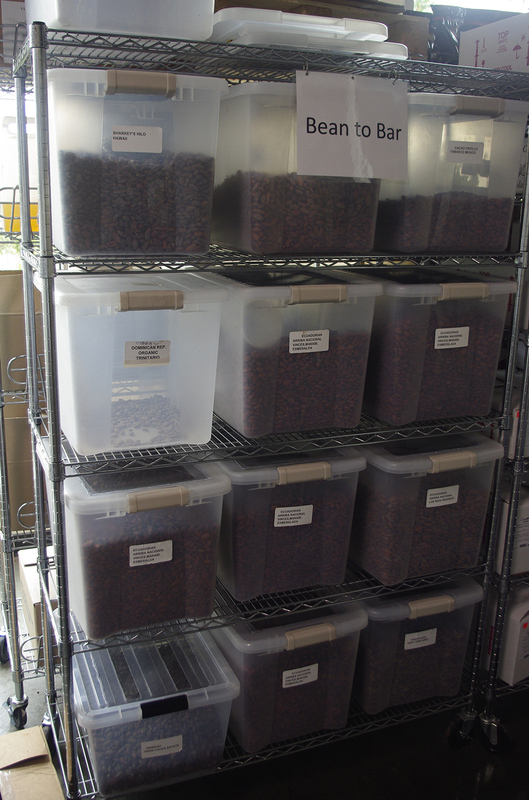 They store many bins of beans from various places around the world, and the smell of them filled the entire place. Not a chocolate smell, but a tangy, fruity, earthy smell. 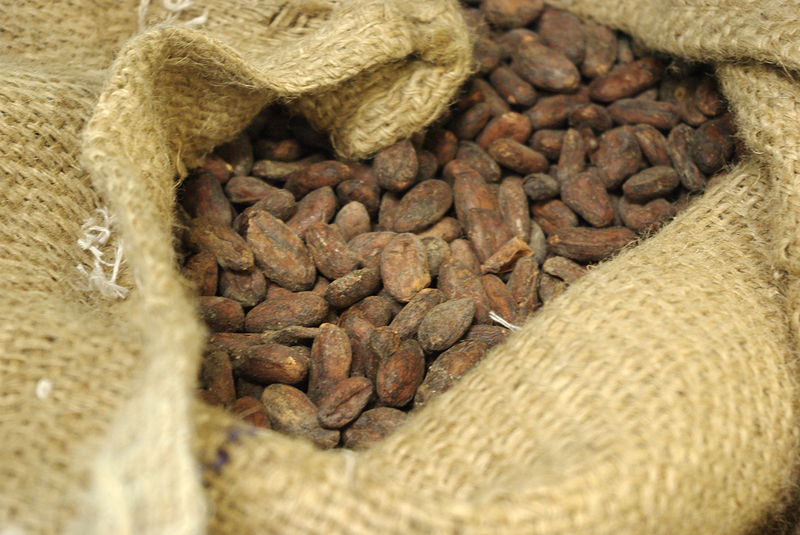 There are three types of cacao beans that are mainly cultivated - criollo, forastero, and a hybrid of the two, trinitario. 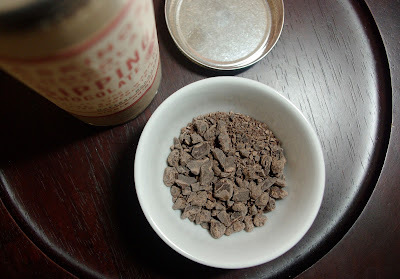 The beans we were using for our class were trinitario beans. 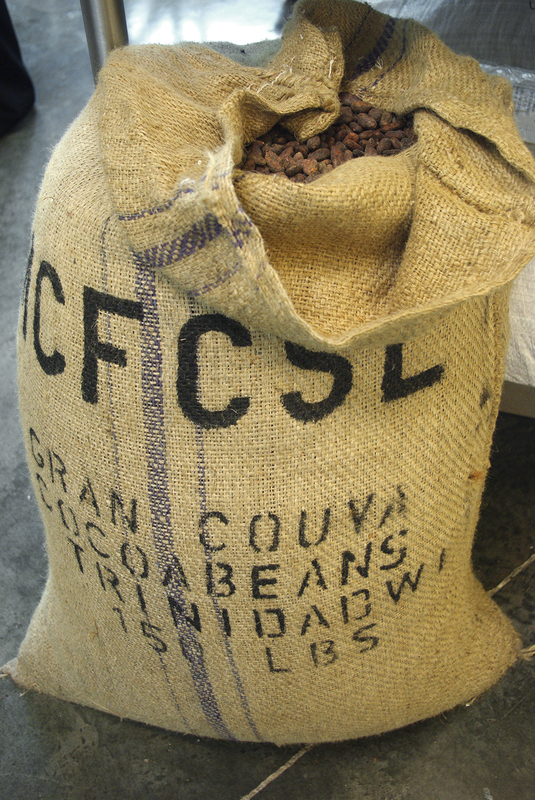 This sack was from the Gran Couva Estate on the Caribbean island of Trinidad. The beans were cut from their pods and fermented on the farm in Trinidad. Once they've fermented the desired amount of time (usually about two or three days), they are dried and packed into sacks for shipping all over the world. First thing we did was sift them. Sometimes bits of the plant, leaves, insects, and other things can get bunched in there as they pack the beans. Sifting them gets rid of all that stuff and just leaves you with whole beans. Which is what is in that bin right there. Sifted, ready-to-roast cacao beans. 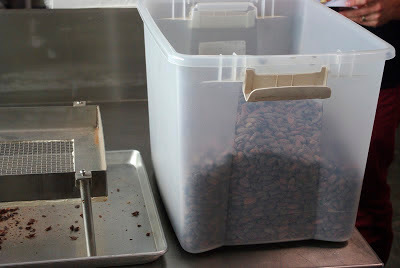 Here's a portion of the storage containers of cacao beans they had there. It was fascinating reading the labels, seeing where each bean had come from. Such an insane variety! 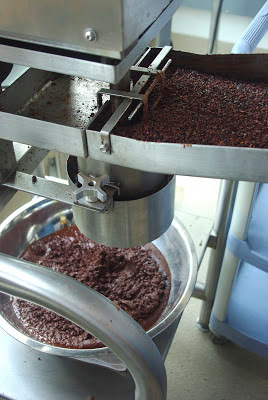 The beans were scooped into the roaster. 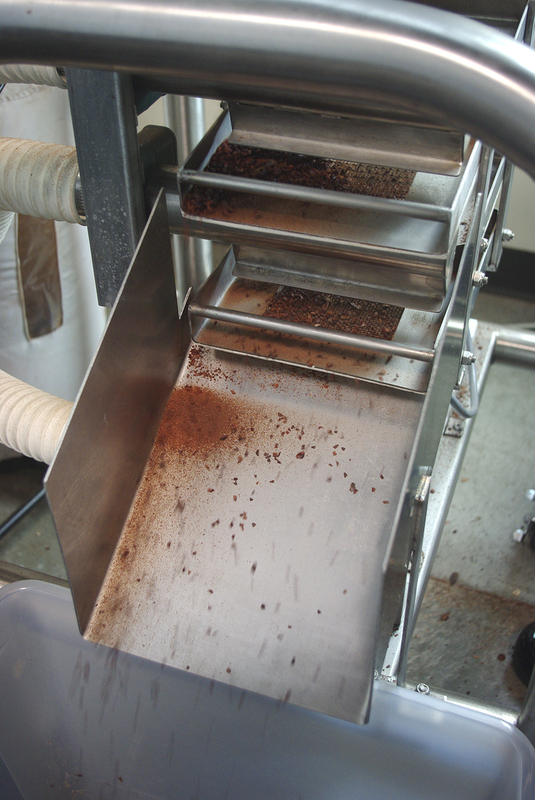 It rotates while the beans roast to make sure they all heat evenly. We roasted them at around 185 degrees for over an hour. 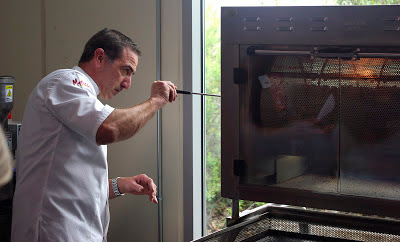 Occasionally, we would pull a couple out to check them and see how the flavor was developing. 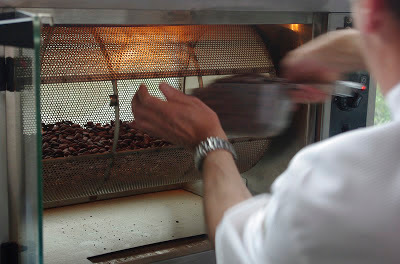 It was amazing to taste how the flavor changed as they roasted! They slowly began taking on fruity tones and a bitterness that you could somehow sense chocolate in. It's hard to explain, because it didn't taste like chocolate yet. 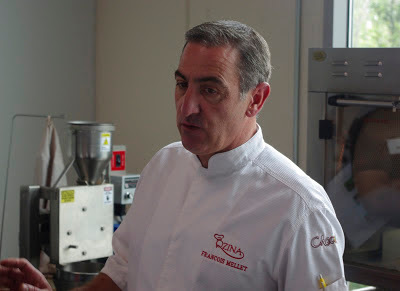 But the scents and tones of what our final chocolate would be were developed here, and I don't think I recognized that entirely until we were done and could taste those same flavors in our finished chocolate. When they had roasted long enough, they had to be cooled quickly, so they'd stop cooking inside the bean. This pan connected to the front of the roaster was a metal screen that had air being pumped up through the beans. We took turns raking and churning them so they could all get cooling air over them. 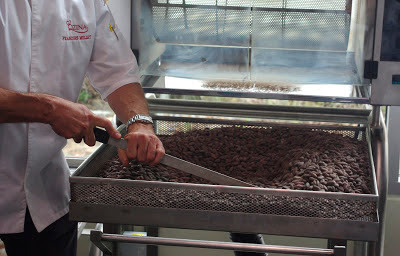 Here they are, roasted cacao beans. They continue to call them cacao until the grinding process begins, when they finally switch to calling it cocoa. The next step was to remove the thin crispy shell around each bean. This shell is the dried pulp of the cacao plant, which the beans are immersed in while inside the cacao pod. The acid that forms and penetrates the bean as that pulp ferments is the first step of creating an individual bean's flavor. But now that we've roasted them, the flavor is there, and it's time to remove that husk. Apparently some pioneer of chocolate making learned that if you cracked the bean, the husk came off very easily. Not only did it come off, but it's very light compared to the bean chunks, so it can be separated out simply by vacuuming them away as the cracked beans fall into another bin. This is called cracking and winnowing, and this is the machine that does it. 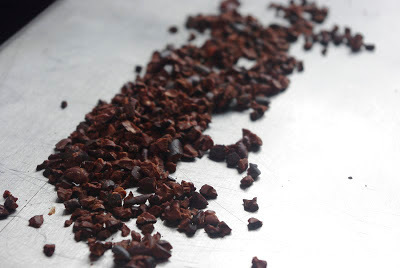 And this is what you now have - cacao nibs. 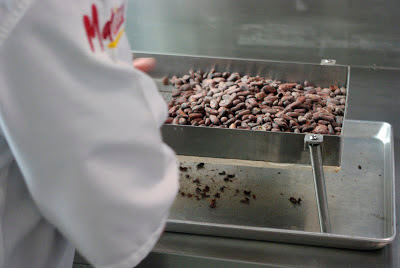 The cracked, shelled, roasted cacao beans. I don't know why they call them nibs. I bought a bag of these months ago online. These are a delicious, albeit bitter, snack, and they are really, really good for you! Chocolate doesn't become bad for you until the sugar is added. You should order some! They are really good in yogurt, ice cream, almost anything. There's even some salad dressing recipes out there that use them, and some meat and poultry rubs! It's still not chocolate yet, though. Those nibs need to be ground up a few times. This is the grinder. It has a filter on it that has little holes in it, and once the nibs are ground small enough, it comes through the holes and falls into the pan underneath. It's becoming liquid because of the fat content in the bean. 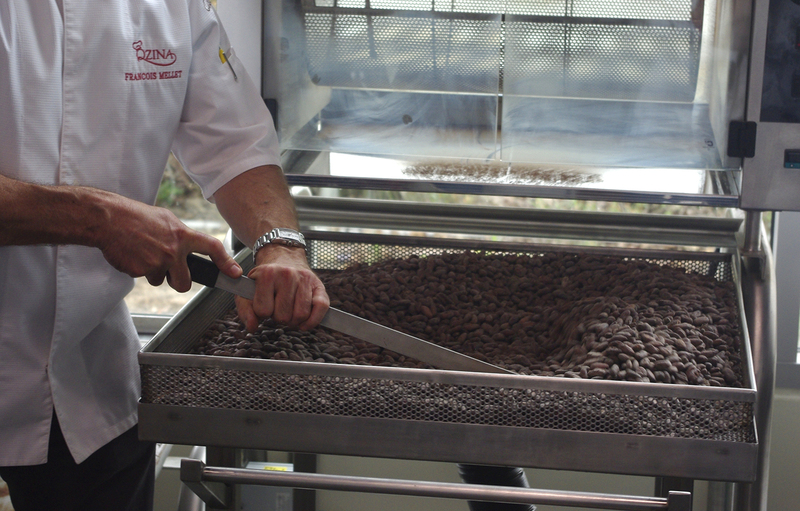 The friction of grinding the beans heats them up, which melts the fat inside of each bean. That fat is cocoa butter. 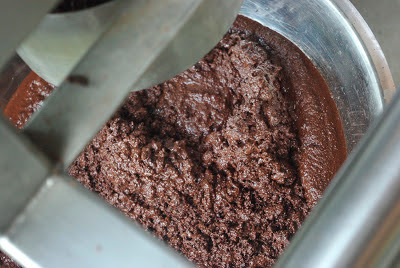 So as the solids get ground smaller, and the fat gets liquefied, you end up with cocoa mass (also called cocoa liquor). Here's the grinding discs. Yep, I tasted that. 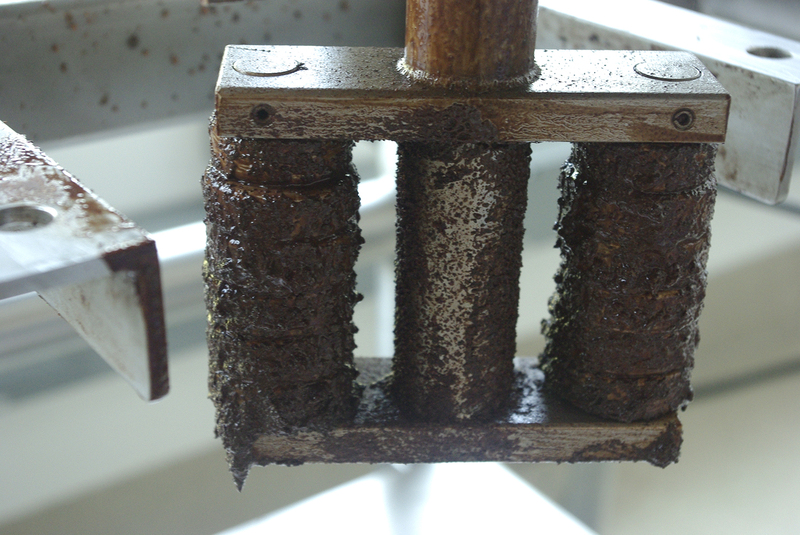 Once that first grinding is done, we change the filter to one with smaller holes. 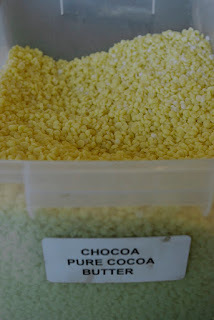 So now the cocoa mass won't drip out until it's ground even smaller. Finally, it's starting to look like chocolate! This is still nothing but the bean. Amazing! We tasted it after every grinding stage, to see if the flavor changed. Once the grinding began, the flavor changed very much, with all that warmed up cocoa butter. It actually got worse! Even though this looks delicious, it's pretty horrible! 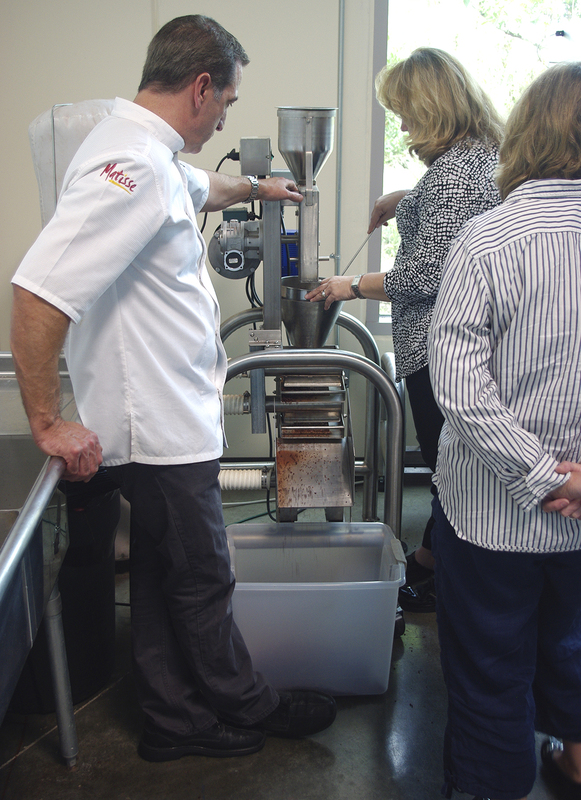 Once the three stages of grinding was completed, we weighed it to see how much of the original 30 pounds we lost during the process. It was just a tad under 20 pounds now! Crazy! The last stage of the day was the refining machine. This metal bucket was filled with steel balls, each about 1/4 of an inch around. Paddles inside the bucket rotated everything, and once we turned this on, it ran straight through the night and even after we all arrived the next morning. This really smoothed out the chocolate into a liquid, not grainy at all. This was also the stage where we added the other ingredients to create our finished chocolate! Once we got the cocoa mass into the refiner, Chef Francois showed us how to create a chocolate recipe. 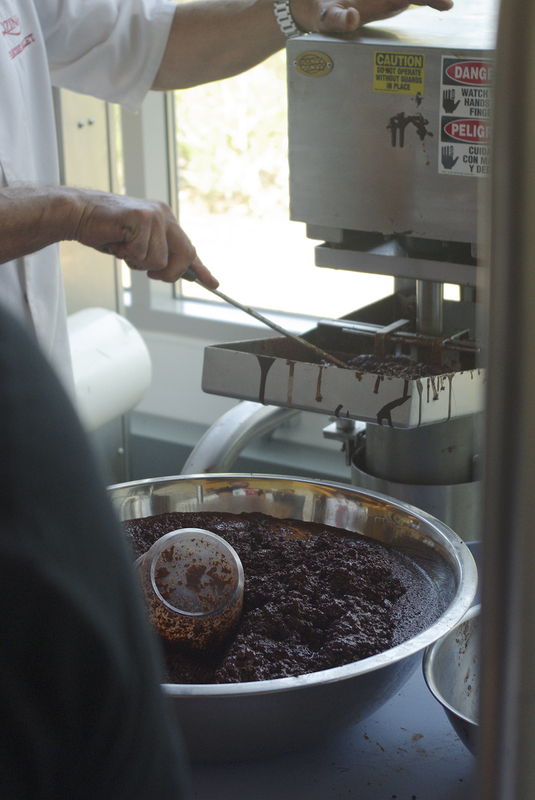 We decided to make a 72% dark chocolate. That means 72% of the entire final product had to be derived from the cacao bean. 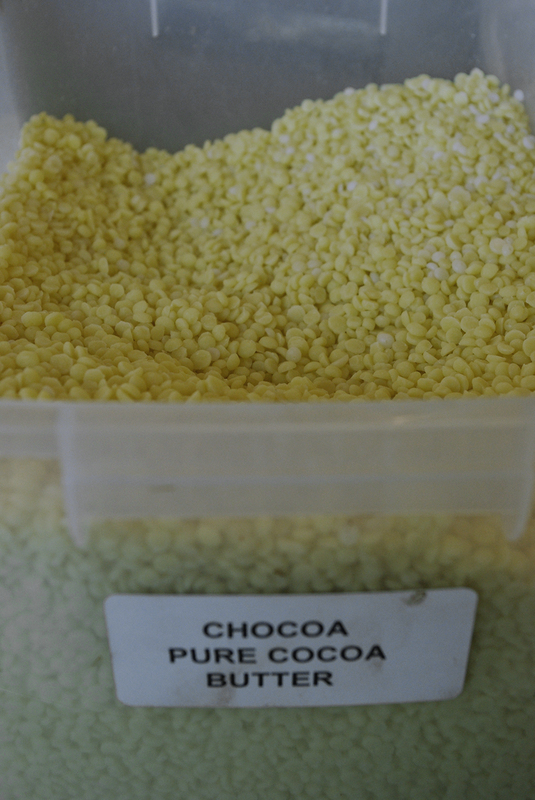 67% of our recipe was the cacao mass we made, then we added in an extra 5% of cocoa butter. The extra cocoa butter would make it a bit smoother and shinier for a better presentation and melting smoothness. This is the cocoa butter. Of course, we all had to taste this, as well. It tasted almost like nothing. Like plain wax. 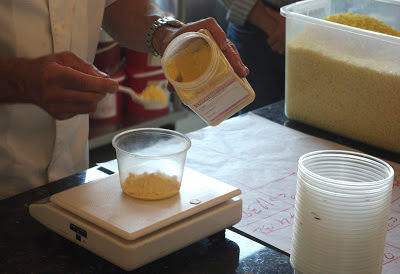 We added 0.6% of lecithin powder. 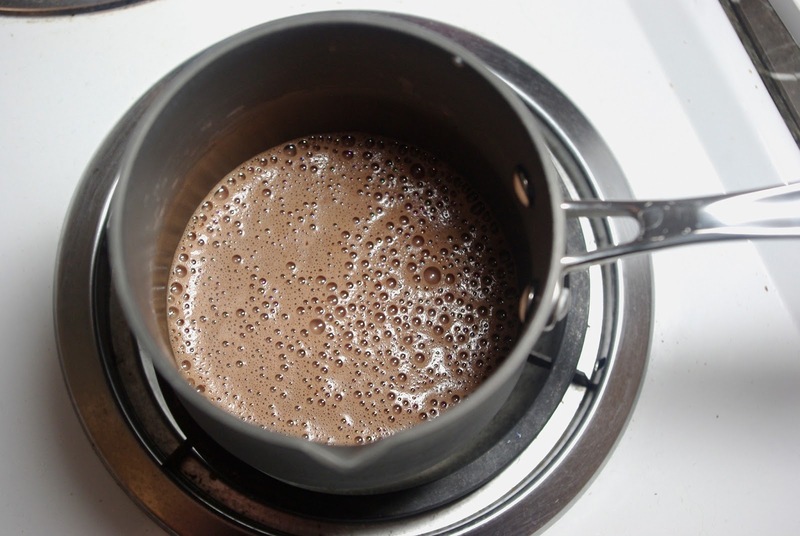 Lecithin is an emulsifier, so I believe it might help keep the cocoa solids and butter from separating once the chocolate is solidified. You know when you have a chocolate bar for a really long time and it gets that white powdery coating on it? That's the cocoa butter separating out from the solids and slowly oozing to the surface. If you ever see that on your chocolate, do NOT throw it away! It's fine, it's still good, it tastes exactly the same. Would you throw away a salad dressing if the oil and water separated? No, you wouldn't. So don't throw away your chocolate! 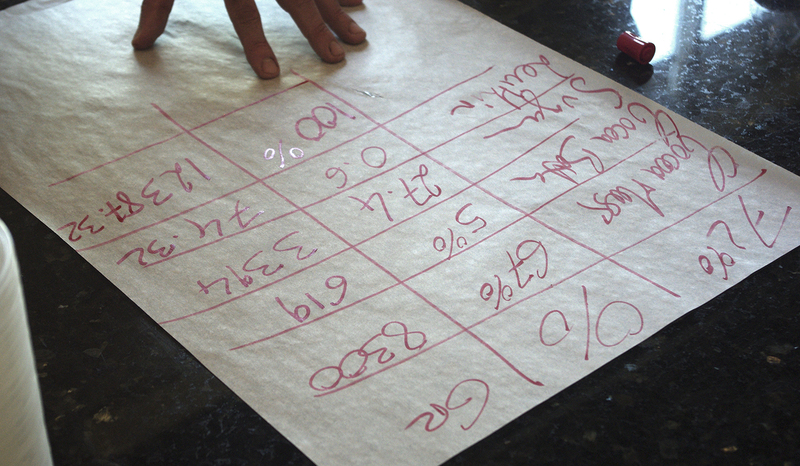 To bring our recipe up to 100%, we added in 27.4% sugar. And that's it! Cacao bean, sugar, and a touch of lecithin. We put the other ingredients into the refiner with the cocoa mass, and it ground them up and smoothed them out right along with the chocolate. For the remainder of the first day, we tried tempering chocolate by hand on the large marble table they had there, and we made some bon bons with some chocolate they had made the day before. 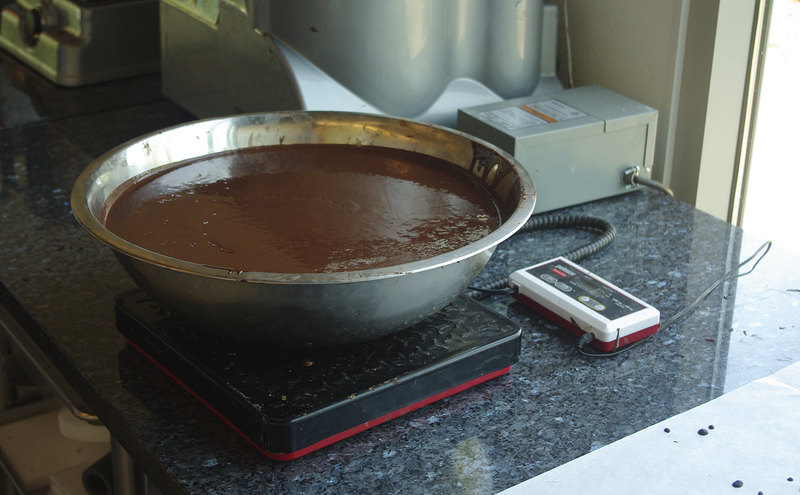 I'll explain more about tempering in the Day Two post. I'll get Day Two posted ASAP! Maybe I'll squeeze in a hot chocolate before that, though. Those are lavender buds in milk. That's crazy! Flowers in milk! When I first came across some recipes with lavender buds, I thought it sounded weird. I'd never had lavender buds in anything. Would the hot chocolate taste like soap? Only one way to find out - make it! So I did just that, and it's awesome. I made it a bit more awesome by throwing some honey into the mix (you can't have too much awesome!). 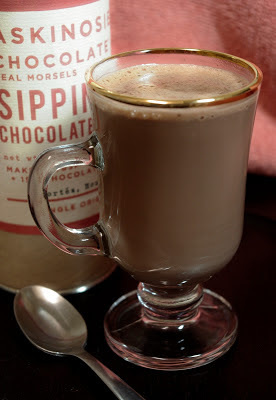 It's like a clear summer day filtered down into a delicious hot chocolate, and you're going to love it. It's not completely unheard of to have lavender in chocolate. Dagoba makes a bar, and a quick google search of "lavender chocolate" brings up a bunch more. Let's take a look at what we need. The two different types of chocolate are going to bring different flavors to the drink. For the dark, I'm using 70% Scharffen Berger, and for the milk, some regular Hershey's. The dark brings the strong chocolate flavor, and the milk chocolate adds in a little creaminess and sweetness to it. The lavender buds are just little closed-up dried flower buds. As soon as you open the package, you'll smell them. Strong stuff! I'm using a brand I found at a local Whole Foods market. The honey I'm using is all natural and from a local farmer's market. It's made by Harry's Honey, and you can learn about Harry here. Put the milk on the stove, medium heat, and throw in the lavender. 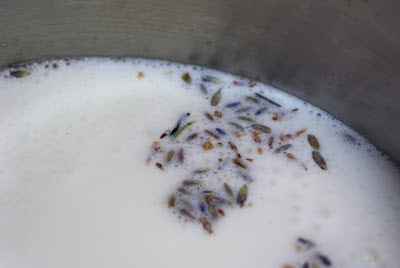 Whisk it around, so the lavender really gets mixed in there. 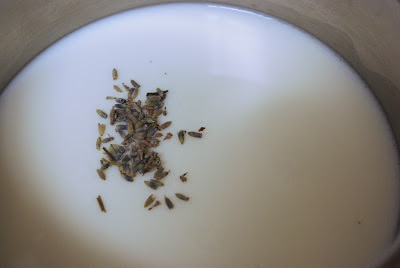 Bring the milk to a simmer, stirring constantly so it doesn't scald. Once it's simmering and steaming, move it off the heat and let it sit for five minutes. This is called steeping, and it lets the warm milk become even more infused with the flavor of the lavender. Five full minutes, no cheating! Maybe even a little more if you want. While it's steeping, let's make some garnish, shall we? 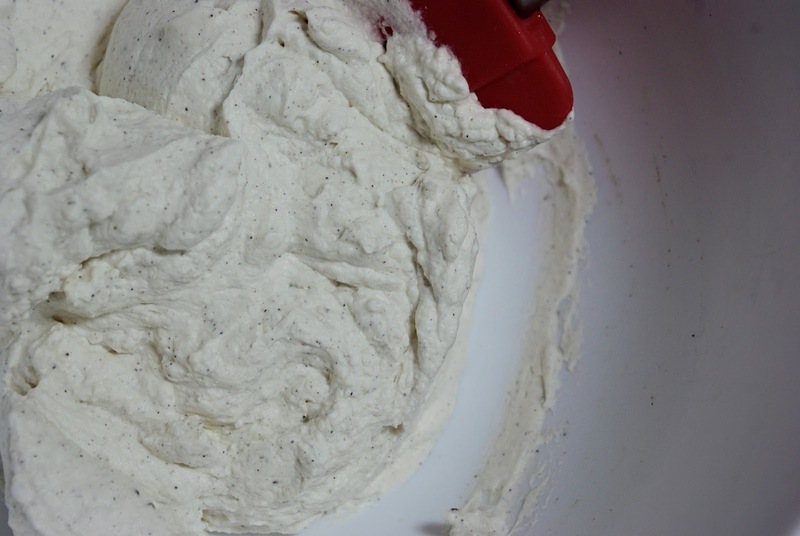 How about some strong vanilla whipped cream? It's quick, easy, and compliments this hot chocolate perfectly. I covered how to make homemade whipped cream back in my posting about peanut butter cup hot chocolate, and it's basically the same process here. Except, obviously, don't use peanut butter in this one. I added 1/2 tsp of Ojio ground vanilla bean and a 1/4 tsp of vanilla extract. And sugar, of course. You can see the vanilla bean in it! So much vanilla flavor! It's delicious! 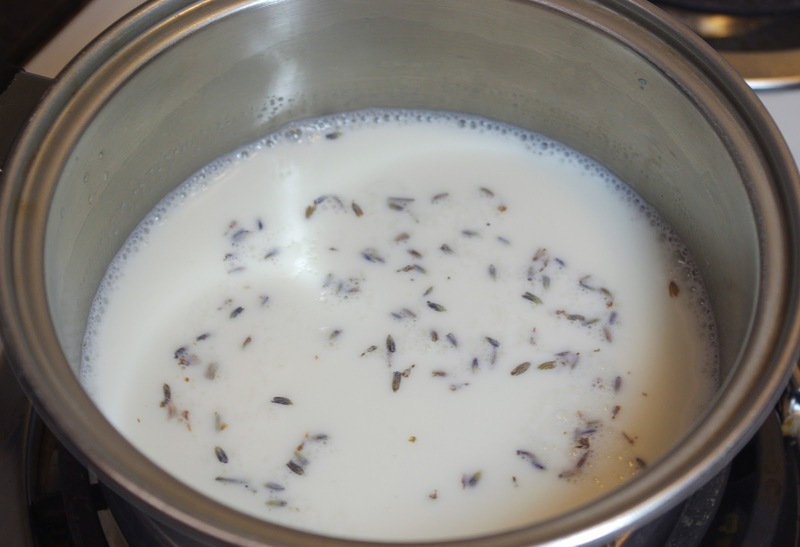 Just pour the milk through it, make sure there's no stray lavender in the pot, and then pour the strained milk back into the pot. 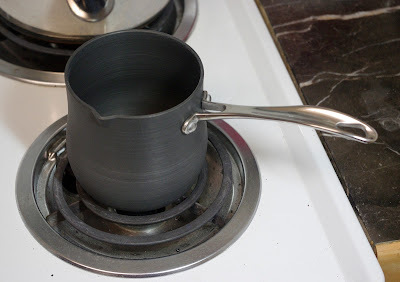 It probably cooled a bit while it steeped, so go ahead and turn the heat back on. 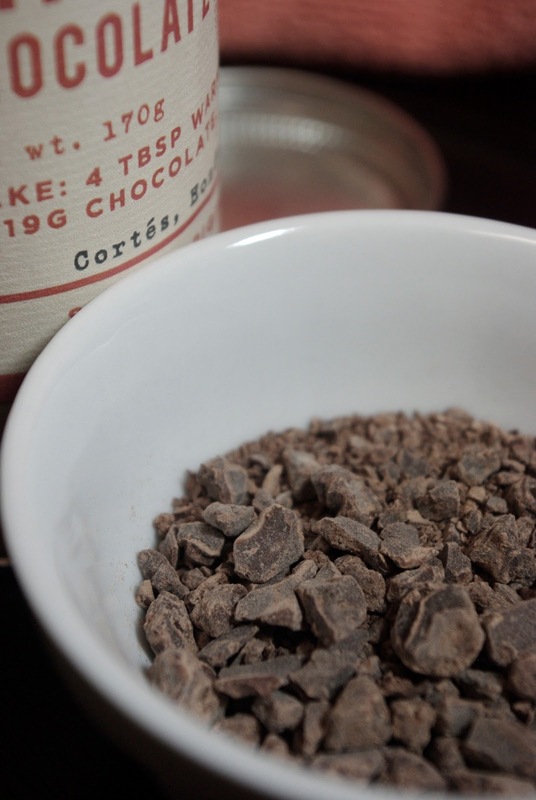 Once it's just about simmering again, add in the chocolates and whisk until melted completely. Turn off the heat and finally, add in the honey. Once that's incorporated fully, you are good to go. 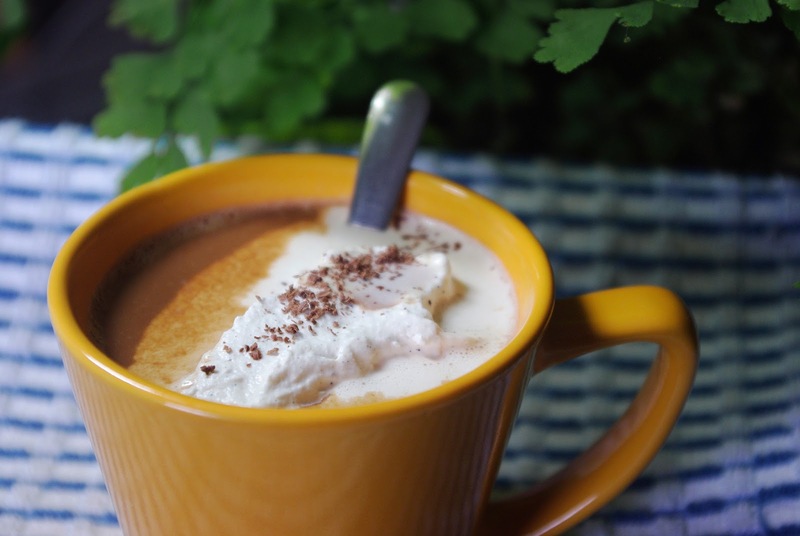 Fill up a mug, top with our vanilla whipped cream, and enjoy! Even if you don't think you're a big fan of flowers or flowery scents, give this one a try. When you're drinking it, it doesn't come across as flowery or soapy in any way, just relaxing. I guess that's why they use lavender in soaps to begin with, right, because it's so soothing and relaxing? Well, that same concept carries over to hot chocolate, too. 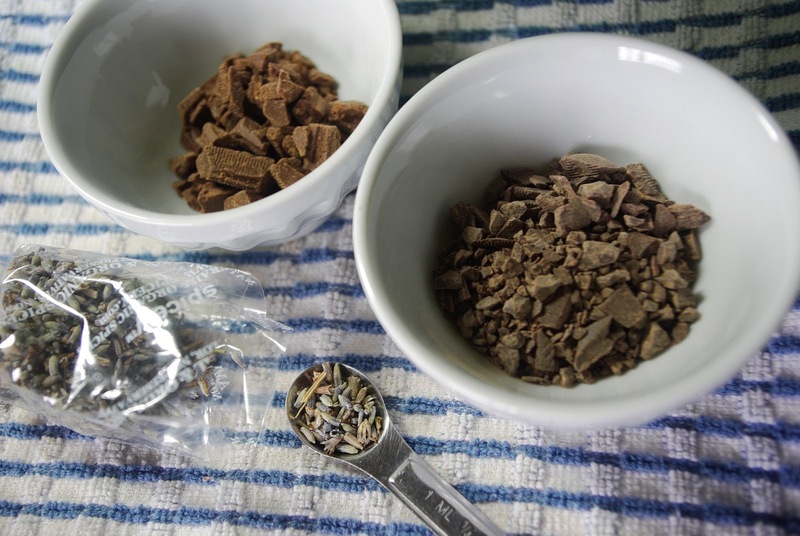 Next post, I'll contrast the relaxing lavender by doing a garlic hot chocolate!